The metal shaper man's blog | Life is a journey in the general direction of an eventual destination..
I’m a long time Freecad user but I’ve been staying away from the bleeding edge of development since the stable build basically worked and suited my needs. I have had way too many irons in the fire in my life for a while and I’ve been attempting to avoid the rabbit holes as well as the blinky lights of distraction for what I want to get done. Most of my area of my limited free-time focus has been on getting my MPCNC to work with Machinekit as well a a semi-secret(at the moment) project I’m planning on Kickstarting. The sultry calls of the sirens of the .17 daily build of FreeCAD have been getting louder. 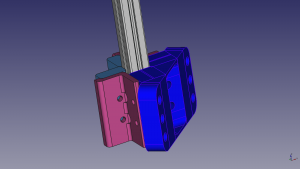 My other fun project is a DIY linear bearing project that I’ve been iterating for the last couple of years. I’m in the rev “L” series at the moment. Here’s a sneak peak. I’ve gotten comfortable to the idiosyncrasies of pre .17 Part Design and can work around them and saw no compelling reason to really change. Well that’s what I was telling myself anyway. So, I wanted to do another variant to my L series bearing and I wound up using the daily build of .17 which I was using for Path. There have been some major changes as you can see from the Release Notes. Basically, the part design workbench have had a major revamp. The most significant to me are the new Body and Part containers. This is a huge paradigm shift that got me feeling like a total beginner at the moment. Unfortunately the dust hasn’t settled yet since there is still very active development, and the documentation on this stuff is a bit scattered at the moment. There are some of the new things that you’ll be able to do. I need to wrap my head around this, and as I figure it out and get used to it, hope to do a few blog post/videos about this. I was moving along, having all kinds of fun ssh’ng into my Beaglebone using my W530 laptop with out any difficulties. My problems started when I wanted do use dual monitors with my docking port. In order to do that, I needed to install the Nvidia proprietary drivers. I got that working and than wound up having all kinds of problems running axis in machinekit. emc/iotask/ioControl.cc 752: can’t load tool table. So this took me a while to figure out which a little help from from Linux guru’s from the makerspace I belong to. I tried that and I couldn’t get that to work. Recently, Xorg changed its behavior to disallow indirect GLX by default. This means that ssh -X no longer works with OpenGL applications, which is a pretty serious problem. The only way to re-enable indirect GLX is to pass +iglx to Xorg. However, GDM has no way to pass arbitrary flags to Xorg. So with the with Xorg program copied into Xorg.original just replace the contents of Xorg with the file above. This worked for me. If you have this issue as well, I hope it helps you out as well. Well, that didn’t work. Then a little more googling brought me to this. I’ve been having some intermittent skipping issues on the Y-axis on my Rockbot and I wanted to go over some of my settings on my polulos.. My table is very smooth running, although in hind site it’s inertial mass is probably a little more than it should be. If memory serves me, I sorted calibrated by feel and sound.. It probably should be dialed in a little better. Anyway, I found this guide. So According to this it looks like my limiter is the A4988 Driver.. It looks like they only want me to drive 1 amp with air cooling only… My motors can handle up to 1.5 amps. Yikes. It looks like I’m stalling out the motor versus triggering the thermal shut off for the motors. So seems like I want to crank this up to 1/2.5 = .4 Volts. Something for tomorrow. I haven’t much time lately for playing around with pencil2d. Work as well as other life commitments haven’t left much gas in the tank for me to pursue fun stuff like this. Currently I’m having a rare quiet Sunday morning moment more or less where I can take a 50k foot view to see what I’m trying to do and hopefully break things down into some manageable bites that I can squeeze in between the chaotic moments of life. This is going to a train of thought post that probably won’t be of any interest to anyone but me, so read at your own risk. So far I managed to separate the bezier from the polyline in the code. There was a desire by the pencil2d developers to have the polyline function in both the bitmap and vector modes. This dual functionality requirement is giving me some headache at the moment. In bitmap mode lines are stored as a bitmap. Trying to maintain this dual functionality at the moment is just slowing me down. Polyline saved as a bitmap can never be edited as a polyline. As new polyline can be either a bitmap or vector. Another requirement, that will need to be implemented at some point. Need to know in the mouse movements we’re dragging a point to move a line(s) or if we’re creating a new line from an existing point. Rather than stripping bitmap out of the polyline code completely I think I should treat it as a non-implemented feature. I think once I get the main functionality implemented for vector mode shouldn’t be that hard to implement for bitmap. Also, I noticed(working from memory) that when qt renders lines it is using a 3 dimensional data to project on a 2d plane. The pencil2d polyline points should be 3 dimensional as opposed to planar. (This doesn’t mean we’re going to use the z at this point, but I think since qt can handle it, why not lay the foundation to have a 3d polyline so it can eventually be implemented…) Ultimately I could see some type vector tool of a a constrained stick figure that could be manipulated frame to frame in 3d space but proect on a 2d plan., This would give the animator a stick figure to place and could draw around it. Seems like that would be pretty cool to do. Hopefully I can map out some small additional steps as well that I can knock off on something other that a quiet Sunday. Research how best practise for handling non-implemented features so I get a break when debugging through the IDE, but doesn’t throw an exception when the IDE is running. Refactor Code to polyline.cpp (et all?) that bitmap mode is a non implemented feature. modify the container objects to accommodate both lines and points. Sub goal. Draw the polyline out with a point to point line using the line object. Get the polyline object to save. Get this working with bitmap mode. When I get this point, the new polyline should mimic the currently existing polyline both in bitmap and vector mode. I would say that would be the point where we’re saying we’re done with that phase of the project. That’s not to say we’re done, done… but at least it gives me a hard edge to strive for.. The next project after that would be do be able to drag a point and have the lines follow it. The way things are structured in pencil2d is that a polyline would be drawn in bitmap mode and a bezier would be drawn in vector mode. In my mind these are two very distinct ways of doing things and it makes no sense to me that they should be combined in the same class. I left bezier.cpp intact for the most part for now and tried disconnecting it from pencil. I think at some point it will need refactoring as well and at some point there should be a bezier icon on the pencil2d sight. Anyway… At this point, the polyline tool is totally unusable. If I do a mousedown I get a line starting at the start of the screen and the line drawing to the current mouse position. This is both vector and bitmap. So… I’m thinking next steps. Get the start of the line to appear at mouse down event. Get the end of the line and new line to start and the second mouse down event. Sometime Linux can really be annoying(I still like like it though). So I’ve been trying to use recordmydesktop to record which saves natively in OGV. Unfortunately youtube doesn’t like OGV you need to convert to AVI. jonasthomas@JTLapTop:~/Videos$ mencoder Issue436.ogv -ovc lavc -oac mp3lame -o Issue436.avi MEncoder 1.1-4.8 (C) 2000-2012 MPlayer Team success: format: 0 data: 0x0 - 0x67d9c7 libavformat version 54.20.4 (external) Mismatching header version 54.20.3 libavformat file format detected. [ogg @ 0x7f8a734c1600]Multiple fisbone for the same stream is not implemented. Update your Libav version to the newest one from Git. If the problem still occurs, it means that your file has a feature which has not been implemented. [ogg @ 0x7f8a734c1600]22 bytes of comment header remain [ogg @ 0x7f8a734c1600]truncated comment header, 1 comments not found [ogg @ 0x7f8a734c1600]max_analyze_duration reached [lavf] stream 1: video (theora), -vid 0 [lavf] stream 2: audio (vorbis), -aid 0 VIDEO: [theo] 1424x832 0bpp -nan fps 0.0 kbps ( 0.0 kbyte/s) [V] filefmt:44 fourcc:0x6F656874 size:1424x832 fps: -nan ftime:= -nan ========================================================================== Opening audio decoder: [ffmpeg] FFmpeg/libavcodec audio decoders libavcodec version 54.35.0 (external) AUDIO: 22050 Hz, 1 ch, floatle, 90.0 kbit/12.75% (ratio: 11248->88200) Selected audio codec: [ffvorbis] afm: ffmpeg (FFmpeg Vorbis) ========================================================================== Opening video filter: [expand osd=1] Expand: -1 x -1, -1 ; -1, osd: 1, aspect: 0.000000, round: 1 ========================================================================== Opening video decoder: [ffmpeg] FFmpeg's libavcodec codec family Selected video codec: [fftheora] vfm: ffmpeg (FFmpeg Theora) ========================================================================== MP3 audio selected. Movie-Aspect is 1.71:1 - prescaling to correct movie aspect. videocodec: libavcodec (1424x832 fourcc=34504d46 [FMP4]) [mpeg4 @ 0x7f8a72c19aa0]framerate not set Could not open codec. FATAL: Cannot initialize video driver. Movie-Aspect is 1.71:1 - prescaling to correct movie aspect. videocodec: libavcodec (1424x832 fourcc=34504d46 [FMP4]) [mpeg4 @ 0x7f8a72c19aa0]framerate not set Could not open codec. FATAL: Cannot initialize video driver. [ogg @ 0x7f8a734c1600]Multiple fisbone for the same stream is not implemented. Update your Libav version to the newest one from Git. If the problem still occurs, it means that your file has a feature which has not been implemented. Movie-Aspect is 1.71:1 - prescaling to correct movie aspect. So memcoder isn’t working. And FFmpeg doesn’t seem to be loaded in 14.04 for some reason or another… But I did find some instructions to get it loaded. [ogg @ 0x26f8500] Broken file, keyframe not correctly marked. This incantation seems to work.